Everyone loves mashed potatoes. Baked potatoes are also a hit. But sometimes you need to switch things up a bit. 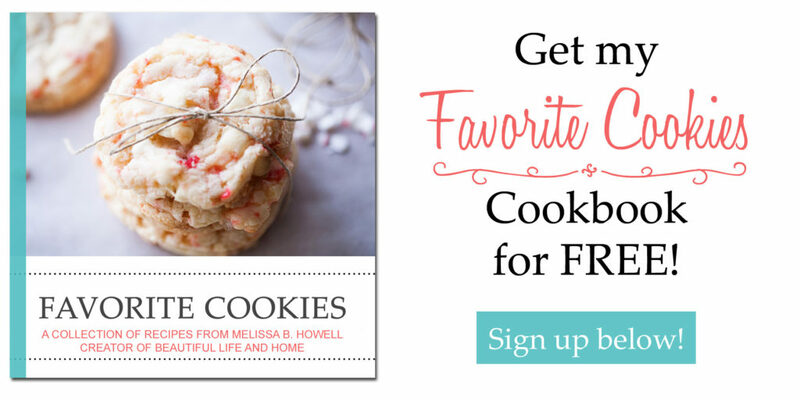 You might even want to make something fancy for special occasions, like Mother’s Day. 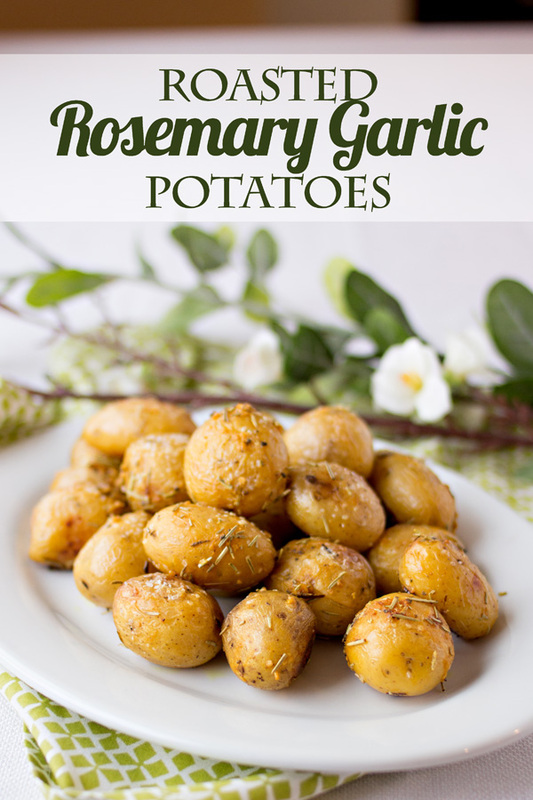 These Rosemary Garlic Potatoes are just the thing! They’re even easier to make than mashed potatoes because you don’t have to peel them! What you’ll want to do is get some teeny potatoes. Some baby red or fingerling potatoes work well. If you can’t find those, you can also cut bigger potatoes into large bite-sized pieces. 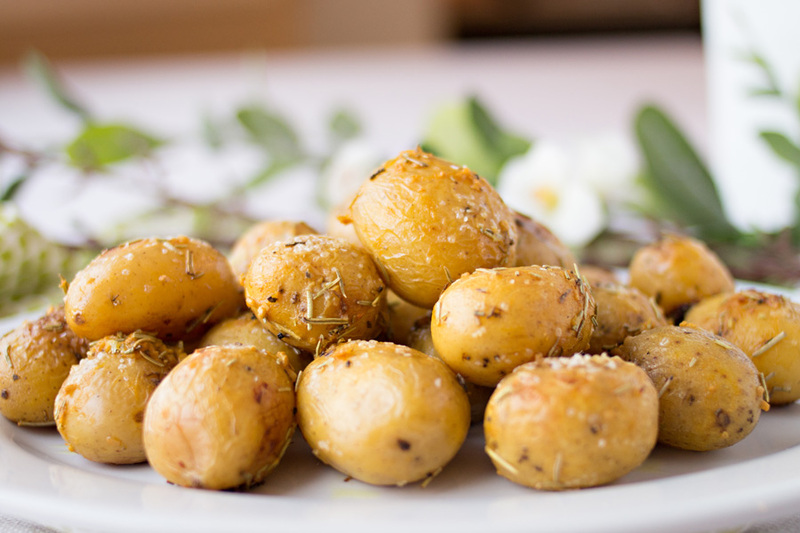 Fresh rosemary is best with these potatoes, but dried rosemary also works. (It’s what I used). The recipe I adapted also calls for coarse or Dijon mustard. We are not THAT fancy around here, so I just used regular mustard. For the garlic, I love to buy the big bottles of minced garlic at Costco. Then I can just spoon out what I need without peeling, mincing, or pressing. To make these delicious potatoes, just boil them, then toss them in a tasty sauce and bake for 10-15 minutes until the skins get crispy. Voila! Impressive potatoes that are super easy to make! 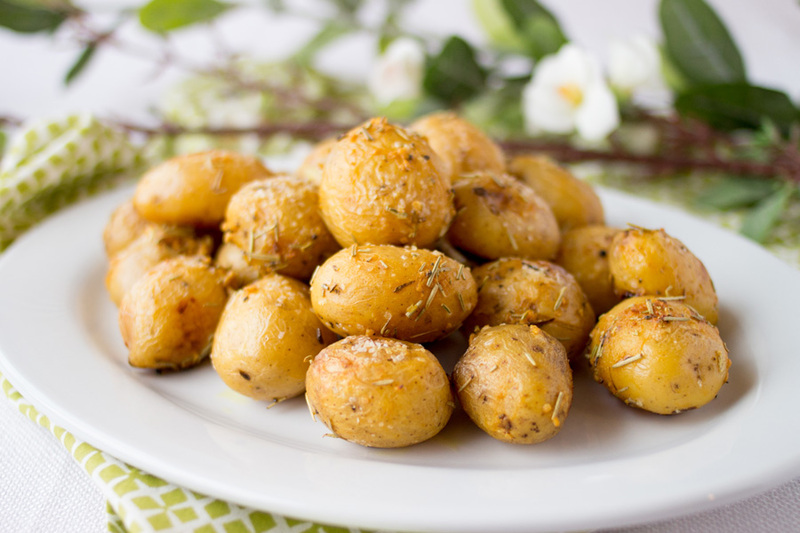 Recipe adapted from Roasted Garlic-Rosemary Potatoes in Our Best Bites: Mormon Moms in the Kitchen. 1 1/2 pounds baby red fingerling, or other small potatoes, washed. Put a large pot of salted water on the stove. Turn on high. While waiting for the water to boil, mix the olive oil, garlic, rosemary, mustard, and black pepper in a small bowl. Set aside. When water is boiling, put in the potatoes and boil for about 10-20 minutes or until easily pierced with a fork. Pour the olive oil/mustard mixture over the potatoes and toss until the potatoes are evenly covered. Pour the potatoes out over a foil-lined baking sheet. Spread the potatoes out evenly. Bake for 10-15 minutes until the skins begin to sizzle and get crispy.